So I have all these random thoughts throughout the day. Thoughts that I think would make good blog posts. And so as I’m working almost round the clock on wholesale pillow orders I compose those blog posts in my mind. I add in witty phrases her and philosophical thought there. And oh, if those words could just flow straight from my brain to my blog you, my readers, would be so well entertained and steeped in knowledge you wouldn’t be able to stand it. Today I am bringing you a blog post – a post that has been hanging out in the wings for a couple years now. This project was one I did for the Christmas issue of Celebrating Everyday Life with Jennifer Carroll magazine. I somehow missed bringing it to you last year and somehow sharing it in May or August just didn’t resonate. So I edited the pics and saved them in the folder all my pics for the blog are in and there they hung out till now. 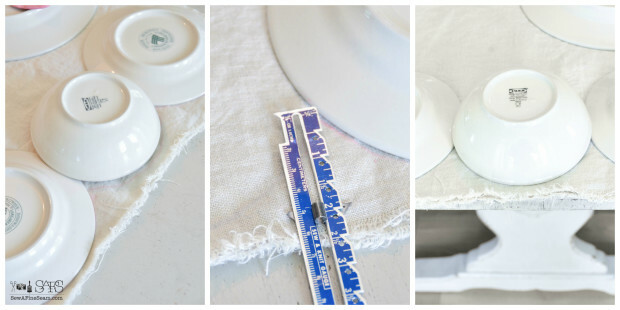 And now you get to learn how to make a Scalloped Linen Table Runner. It’s really quite simple and nowhere near as hard as you might think if you have never made anything other than straight edges. Point turner (optional) Step 1. 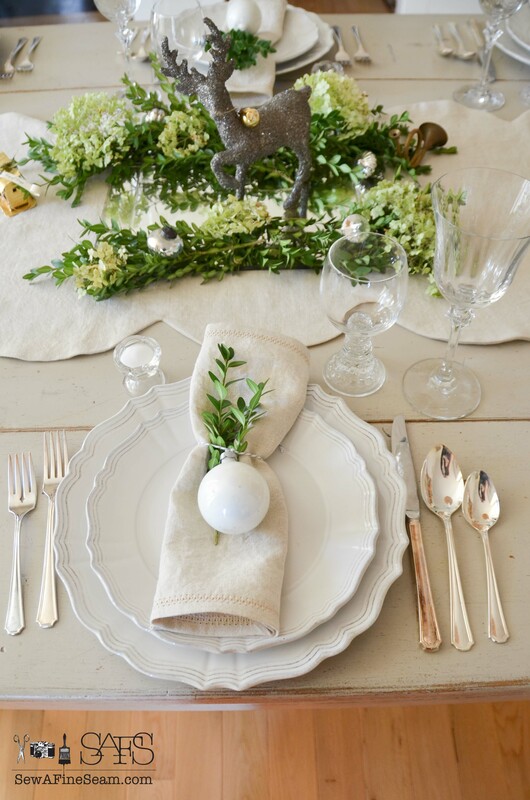 Choose your fabric – Belgian Linen could be used year round, and also adds an elegant touch to any holiday table. Vintage fabrics, grain sacks, vintage ticking or printed cottons are also great choices. Step 2. 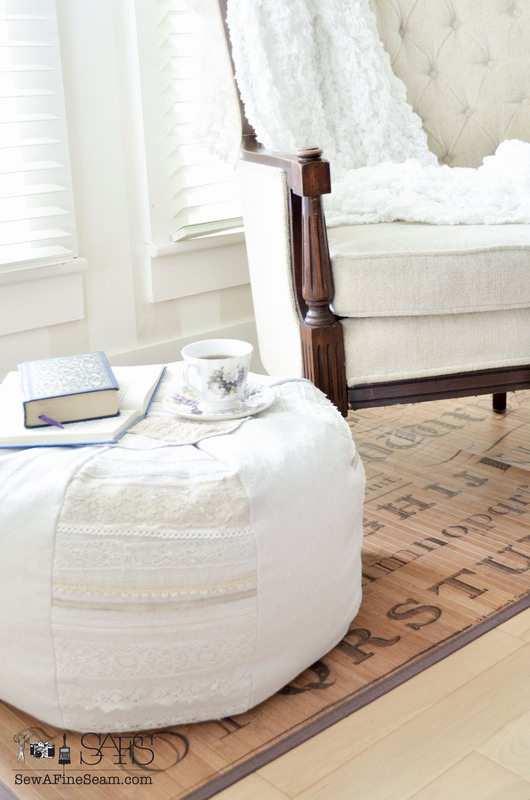 Determine the width and length you want your runner by laying fabric on your table to see what looks best. 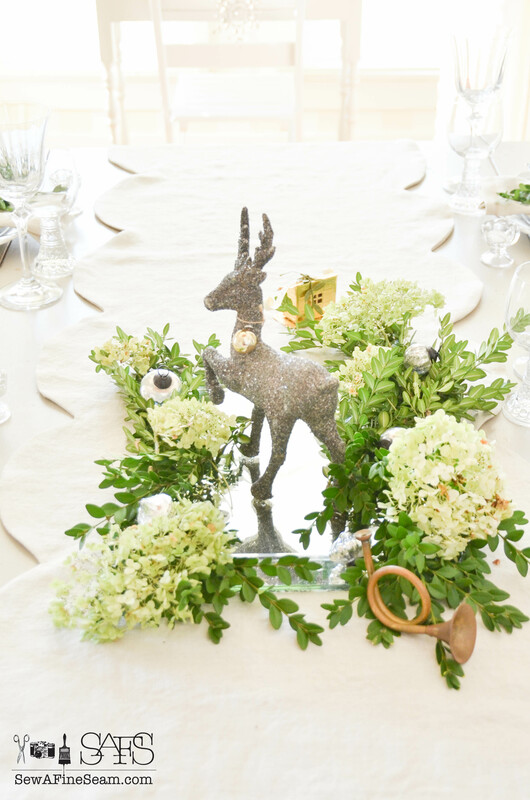 Runner s can be made to hang off both ends of the table or you can make them to stop a few inches from the edge of the table. Step 4. You can make the scallops as deep into the runner as you prefer. Lay 2 plates side by side – if the scallop goes deeper than you want it to, measure from the edge of the fabric to the depth you want one scallop to stop and the next to start. Trace the plate up to that point and stop, move plate to next scallop placement and trace starting at the point where you stopped the previous scallop. Continue till all scallops are traced. Step 5. Lay your fabric with the traced scallops on top of your lining with right sides together. Cut along the scallop lines you have drawn, cutting through both fabrics at one time. Step 6. Pin together as much as you feel comfortable with, sew the scalloped runner together with a ½” seam allowance. Leave an opening in one of the scallops for turning. Step 7. Use pinking shears to trim seams close to stitching. (if you don’t have pinking shears you will need to make small clips with scissors all along the curved edges) With small scissors clip each point of the scallops almost to the stitching so they will turn nicely and lay properly. Step 9. Press well, turn edges of opening to the inside and press in place. Step 10. Slipstitch opening closed. Press again and use the next time you host a dinner party. See how simple that really is? And the bigger you make the scallops the easier it is to sew. Smaller curves and corners are a bit trickier but still not something you need to be afraid of! You could totally use whatever fabric you wanted to create whatever look you were going for. 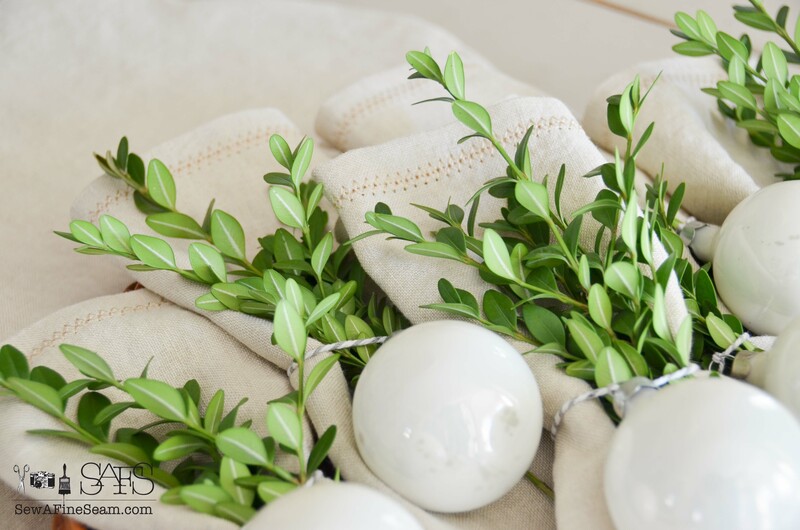 I loved linen and I had this Belgian Linen that I’d been hoarding so it seemed the perfect time to use it. It works up wonderfully, the heavier weight of the Belgian Linen is just awesome. Want some inside information into a bloggers world? I shot this Christmas table setup on a warm late-summer day. I dug through boxes of Christmas decor to find some ornaments, the glittered deer, and a nativity, and cut some boxwood clippings. Magazines have to be planned, photographed for, and printed well in advance of the season they are supposed to come out for. 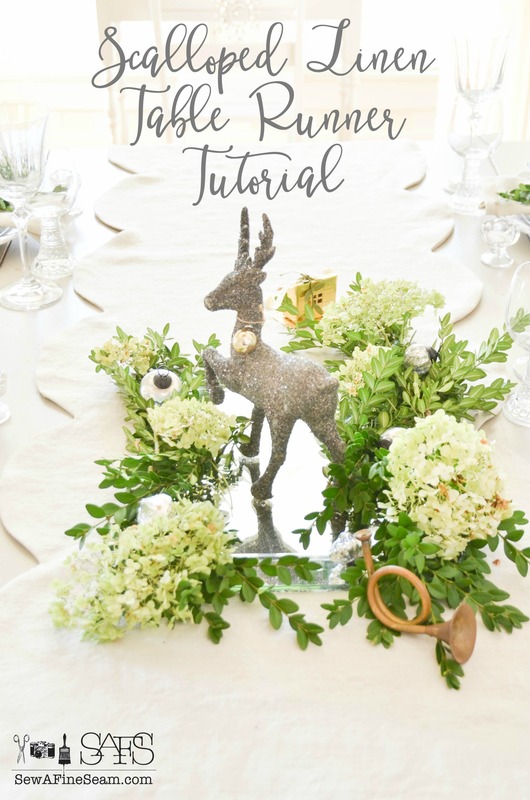 Same is true for Christmas decor, tutorials and crafts for blog posts. Next week is Thanksgiving – and then the push towards Christmas will be on in full swing. Try to take time to enjoy it amidst all the hoopla of preparation, shopping, gift wrapping, DIYing, crafting, baking, and whatever else your Holidays looks like! 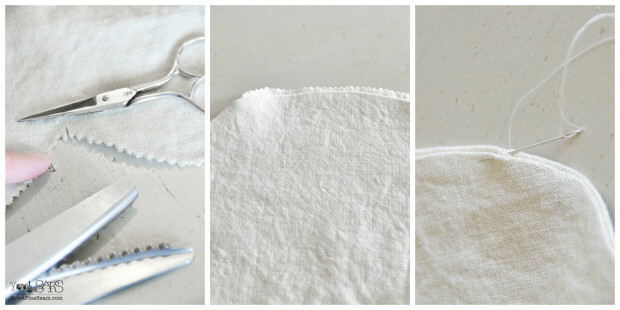 I made the hemstitched napkins too – I’ll show you some more photos of them and give you the how-to for those too! 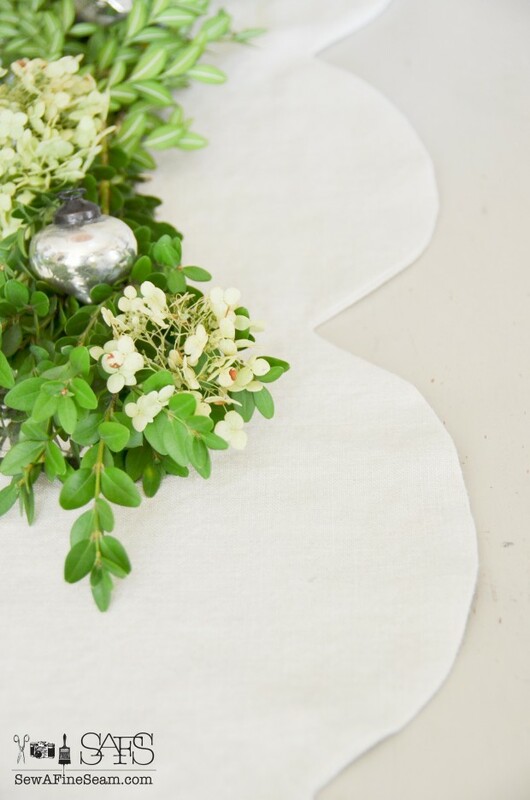 If you make a scalloped table runner I’d love to have you send me a pic of yours! I just love this project Jill! I just love this. 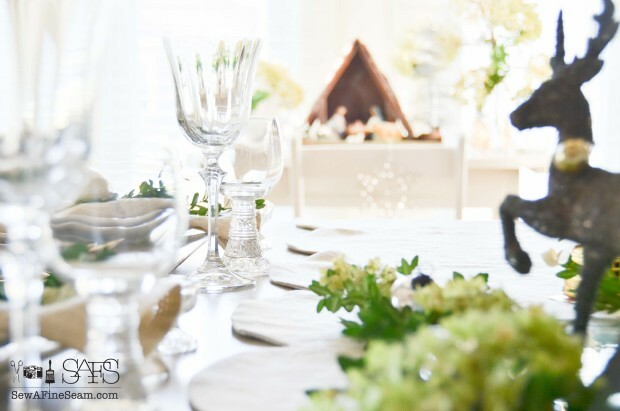 The table runner is so pretty as well as your table setting. Thanks for sharing. Thanks so much Sandy, I really like the way the linen works for this design. 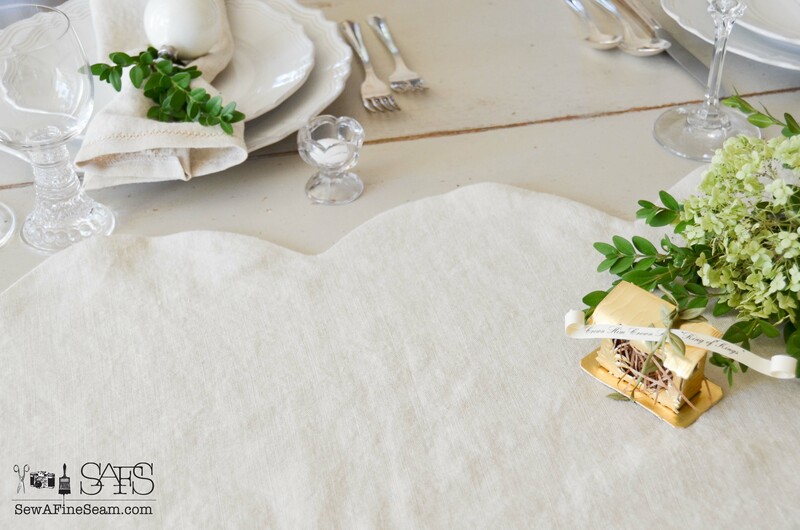 How lovely, Jill and a great idea to freshen your table from a straight edged runner or tablecloth. I definitely will try this. The runner reminded me of a dress I made years ago with a scalloped-shaped hem. It was a sky blue-colored sleeveless shift. I saw the pattern in a department store where I worked as a teenager and thought it was so cool! I received tons of compliments asking me where I bought the dress and I recently found a pic of one of my older cousins wearing it. Ah–those were the days. :) Happy Thanksgiving to you and your family. So Beautiful! Thanks Jill! I am actually sewing table runners this week! I wasn’t able to order your pillows. But I sure love them! Happy Thanksgiving to you and yours! Scallops are so fun aren’t they Tricia? I made a dress for one of my girls for Easter when they were little that had a scalloped edge! Hi Jill, as always you are busy as a bee. Take time to breathe tho ok? do you have any help or are you working into the night? Be careful that’s how people hurt themselves. There’s only one of you and your family needs you as you are, great Mom and wife. This was such a terrific project, had to save that for next year. On Dec. 7th. (forgive me please if I’ve told you already) will be having my right shoulder replaced. This one will be harder than knees so if my insurance pays for it will be going to rehab place for few days after I get out of hospital. Can’t count on hubs to do as I need afterwards so to avoid alot of bad feelings will take care of myself by going to rehab. 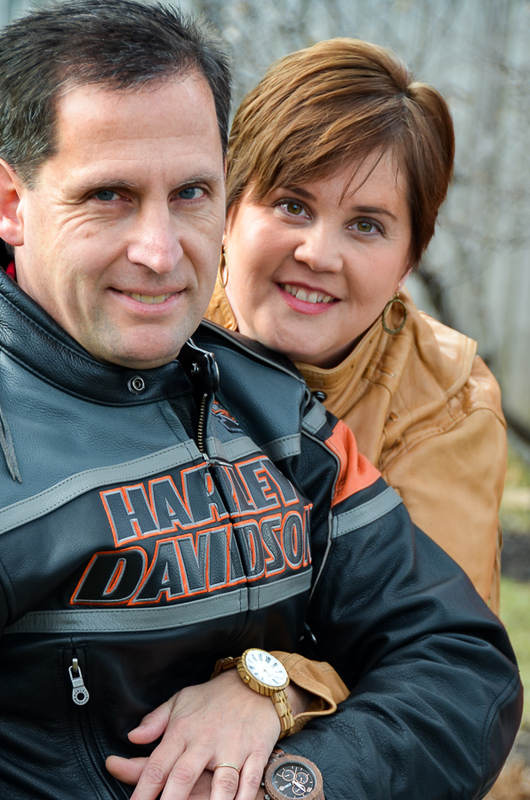 He has been worse than usual so not going to put myself thru that when I need to be healing. At this point that has to be my first priority. Sure will miss my dog and cat tho. This might sound awful but I’ve had enuf, can’t deal with his attitude and abuse any longer. Sorry won’t say more. Hope your family has wonderful Thanksgiving and happy weekend also. Thanks for the concern JaneEllen! I have been so very busy but I do have help. I have two assistants helping me with the business and my husband helps out around the house A LOT. I don’t stay up working late too often. I just can’t keep going if I do that too much! Beautiful!! 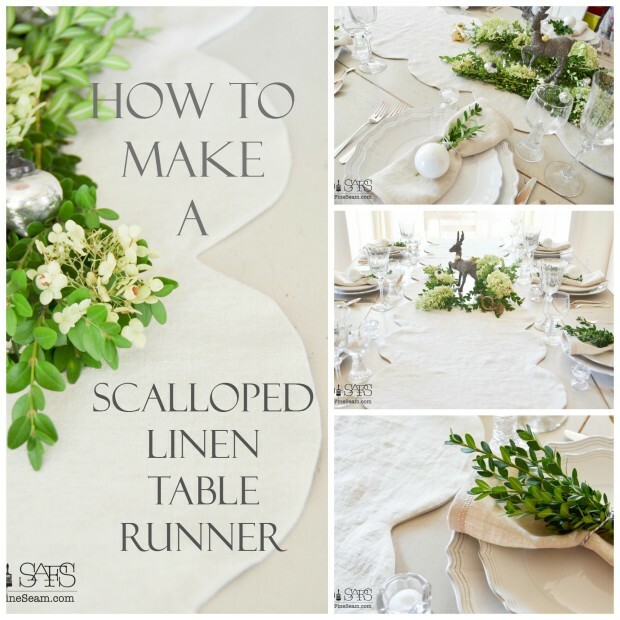 I love table runners and the scallops are so, so fun! 🙂 I haven’t really used the table runner much – I hate to mess up the lovely Belgian linen! What a sweet look, Jill – and I love the napkins and will look forward to the tut – I’ve never made any other than rolled hemmed napkins. Thanks Jami! The tutorial for the hemstitched napkins will be up on the blog tomorrow! (dec.4) It’s really so very simple – a little trick makes all the dif!